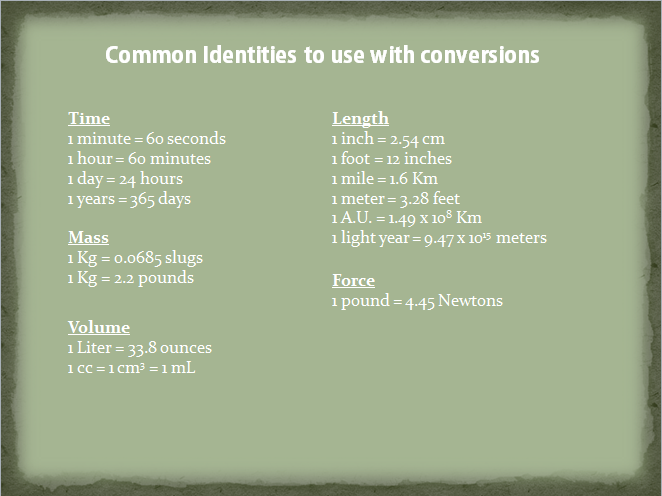 The mathematical method of converting one measurement into a different unit is called unit analysis. This is an important skill to master for any science class. How many seconds is three min­utes? Most people very quickly would say 180 seconds. No problem. Most of you just multiplied 3 by 60. How many minutes is three seconds? This is a little more confusing. It isn’t immediately obvious that the answer is 0.05 minutes. The process is exactly the same. If you follow the pattern given, every unit conversion is the same. Multiplying a measurement by an identity is really just multiplying it by the number one. Which is larger, one minute or sixty seconds? How about 1 dollar or 10 dimes? Since they are the same thing and any number divided by itself is one, the identity doesn’t really change the size or amount of your starting quantity. It only changes the unit that you are using. If you have a more complicated problem like, “How many seconds is six years?”, the process is still the same. You just do it many times using different identities until you get to the unit that you want. Some of you are going to be challenged by Unit Analysis. This is an essential science skill so you need to practice. If you have trouble with the 1.4 Review Questions, come back and watch these tutorials. Need more practice? Click HERE for some on-line opportunity.